SINCE 2014, all work and travel and art and life stories on this blog are combined on the “Home” page of this blog. I hope you enjoy it. 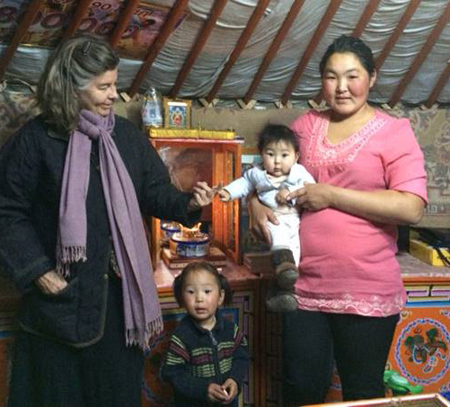 In October, 2014, I was invited to Mongolia to speak to government officials, professors, parents, teachers, all interested in Montessori education mainly because the department of education is being revamped to put children at the center of their programs, instead of an outdated curriculum. Consulting in schools I found a very open-minded group of teachers and administrators, and government officials who are excited to move toward true Montessori for Mongolian children. After work in the capital, Ulaanbaatar, we traveled far out into the grasslands to research the traditional ways or raising children from birth. The woman in this picture is a high school science teacher. Her husband is a herder and they have decided to raise their two sons in the traditional life of Nomads, moving their ger (yurt in Russian) several times a year to follow the grass for the herds, milking mares and fermenting the milk, following their Tibetan Buddhist religion (see altar in the background) and being close to nature. When the boys are older they will return to a village where the mother will teach. Partly thanks to the interest of this woman, since this trip the book The Joyful Child: Montessori, Global Wisdom for Birth to Three has been translated into Mongolian. 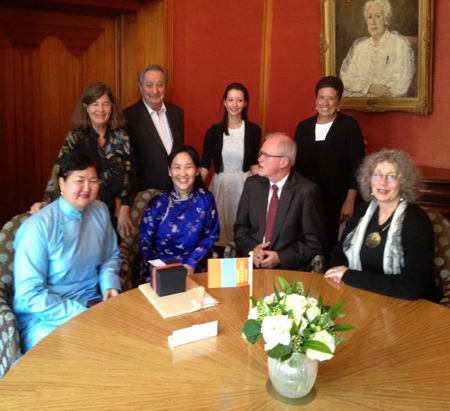 In the spring, at the international Montessori headquarters we celebrated the formation of the AMI (Association Montessori Internationale) Affiliate Organization of Mongolian Teachers. 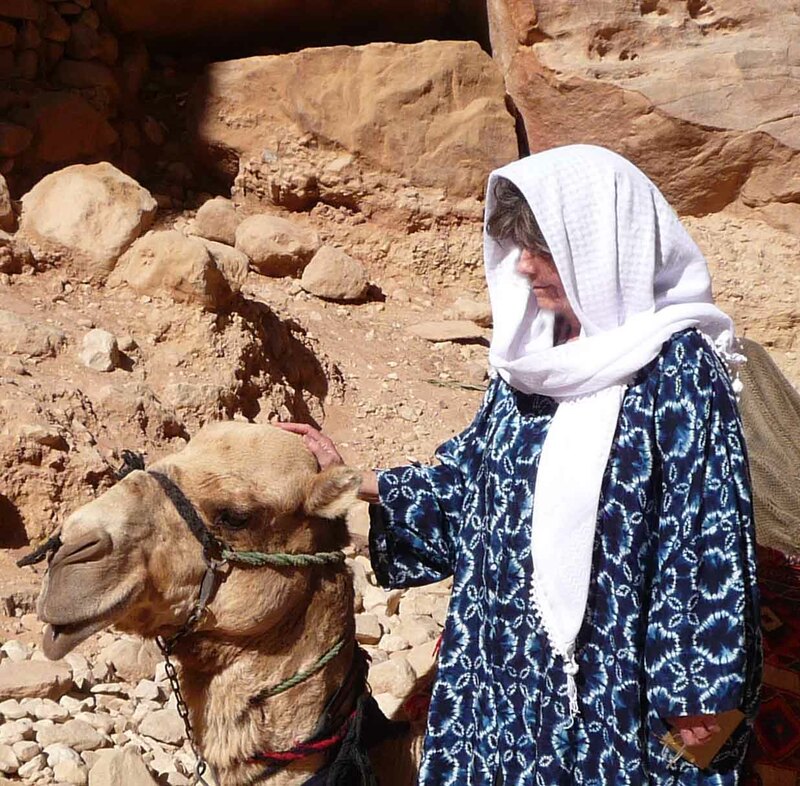 (Friend camel at Petra in Jordon, being petted by Susan) After Montessori work in the West Bank of Israel (that, sadly, cannot be pictured or described here) we traveled to one of the 7 wonders of the world: Petra, in Jordan. Arriving at Wadi Musa (Valley of Moses) in Jordon in the evening we hiked the 2-mile downhill path to Petra through a narrow passageway known as a “siq” (“seek”) lit by 1800 luminaria (candles in paper bags). At the bottom, in front of the most famous structure carved out of the stone cliff “the treasury” we heard ancient bedouin music. A 1-stringed precursor of all stringed instruments, and an ancient flute. 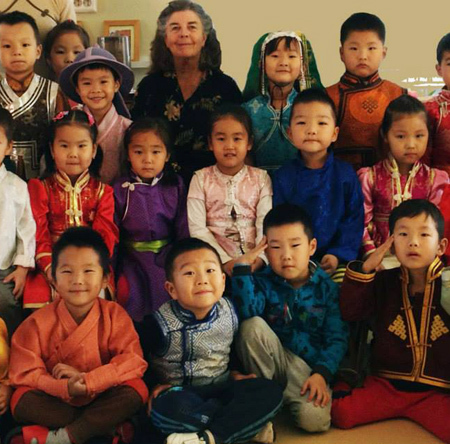 Montessori work in Thailand, Nepal, and Bhutan. 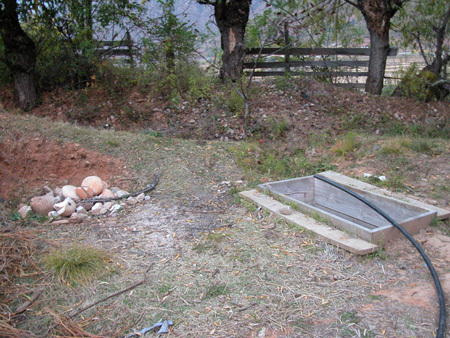 Here is the best “Bhutan hot stone bath” Youtube video I could find (though our bath had no plastic tent over it!). 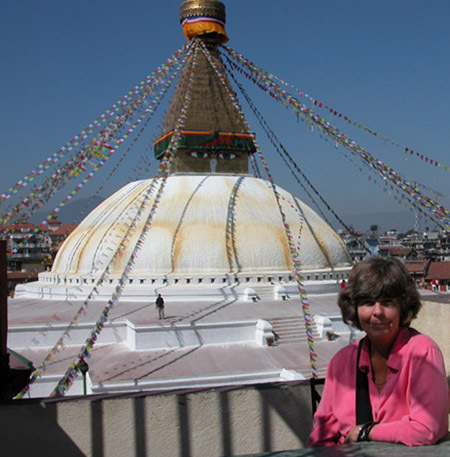 From my first travel, around the world by shipboard in 1964 to Montessori work in Nepal in 2005.